The U16s train with Head Coach Jan Crabtree and a great team of assistant coaches and team managers. As the top team in the junior section of Weston Park Blades, the U16s train and play at high intensity and many players are part of SuperLeague pathways. The club is very proud of all of the U16 squads in the last six years who have reached National Club Finals, culminating in 2014 with silver medals at the U16 National Championships. The Under 16s usually train on Wednesday evenings from 6:00pm to 8:00pm at Sparsholt. This is Bridget, she’s 12 years old and is in class P4 at New Eden School. Her hobby is, of course, netball, she plays in any position! 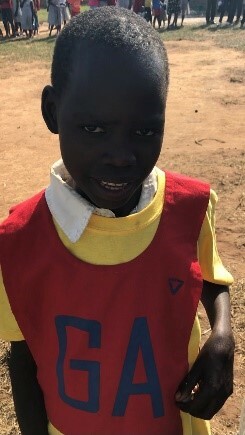 Her family are very poor and the U16s are sponsoring Bridget via YuYo to help her get the schooling that will change her life.